Writing blog posts for the Community Health Center, is generally pretty interesting. I get to write about a wide array of topics from snow removal and construction to nurse practitioner residency programs and diabetic retinopathy. Sometimes times, it can also be really fun to go out and gather information for a blog post, and today was one of those days. I went over to the Farmer’s Market on Main Street in Middletown, sponsored in part, by CHC. I’ve always loved going to Farmer’s Markets and the one on Main Street was no exception. 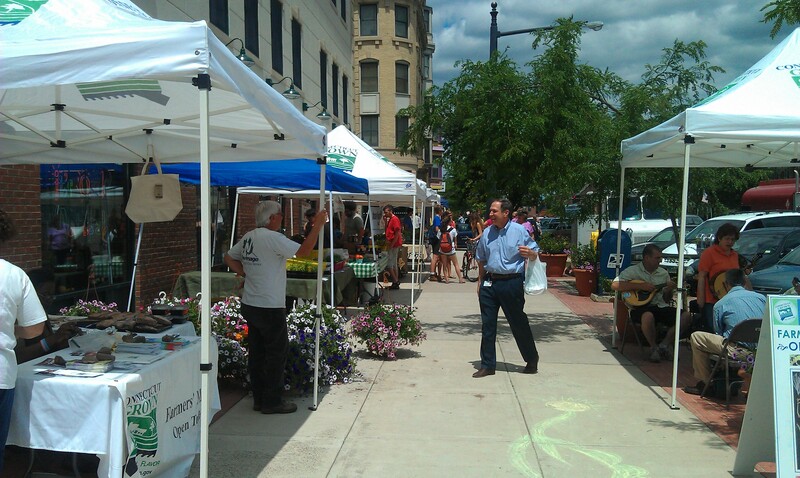 It is smaller than some of the other Farmer’s Markets I’ve visited in Connecticut, but it is also very important for a whole lot of different reasons. First, as is the case with most Farmer’s Markets, it had fresh local food. Personally, I’m a big locavore. For the sake of our earth, we should be eating more food grown locally, and not shipped half way across the country. I’ve been told that the average bite of food travels at least 1500 miles from the field to the mouth. We end up using a lot of fuel to move all that food around that much. I don’t have any detailed studies to back that up, but when I think of where so much of the food in the grocery stores comes from, it sounds about right. Besides saving fuel and helping the local economy, locally grown food is generally fresher and tastes much better as a result. Yet there is an even more important reason why Farmer’s Markets are so important, food deserts. These are areas where it is difficult to obtain healthy food. According to the U.S. Department of Agriculture Food Desert Locator, Middletown isn’t in an area defined by the USDA as a food desert, but even here, we need to make it easier for people to get healthy food. Some of the other cities where we have offices have large food deserts and Farmer’s Markets can help. Community Health Center is becoming a sponsor and children who come in for appointments will receive tokens redeemable for fresh produce at the farmer’s market. CHC is always looking for new ways to build healthier communities. Supporting farmer’s markets is an important way health centers can help build healthier communities. It is also a fun and tasty way.